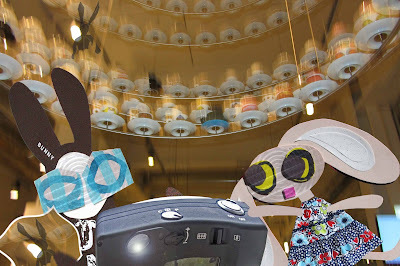 The Wabbit was describing a dream and Skratch the Cat could make neither head nor tail of it. "It was this big," said the Wabbit, "and it came slithering after me." Skratch did his best. "How did you feel in the dream?" 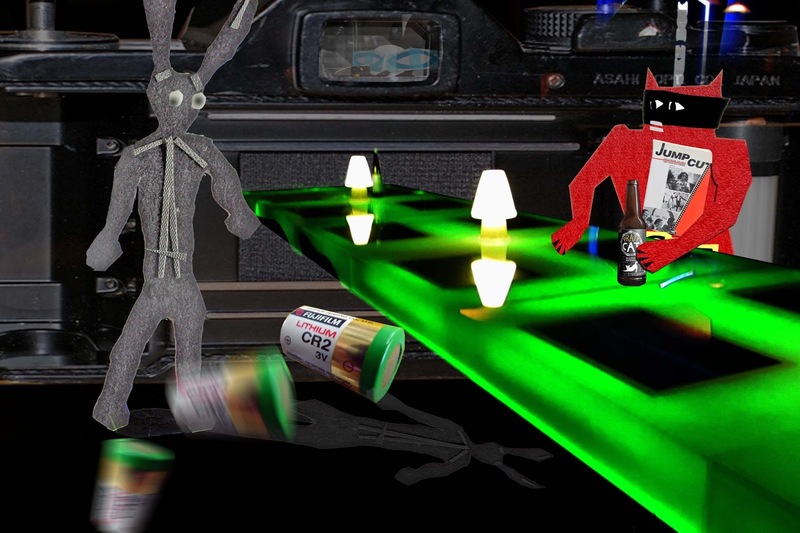 "Uncomfortable," replied the Wabbit, rubbing at his fur. Skratch waited for more information. 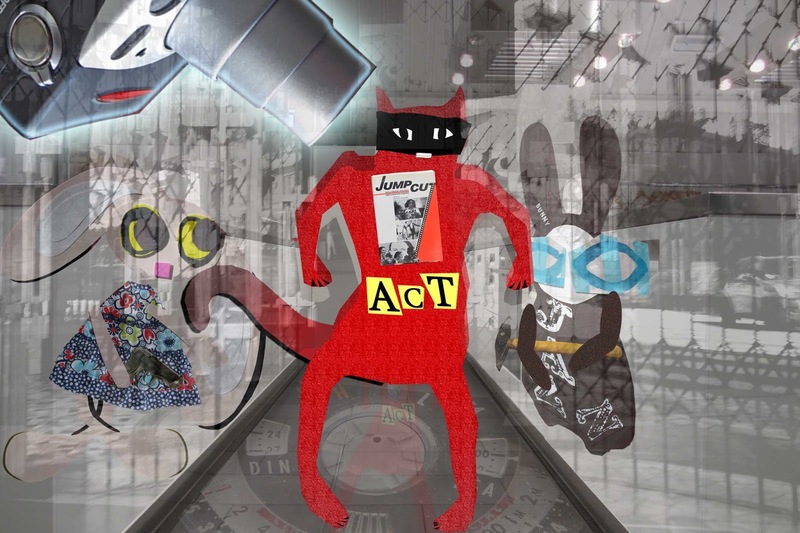 "Then a cat came," said the Wabbit, "and it followed the thing that was following me." "Did you recognise the cat?" asked Skratch. The Wabbit shrugged. "No, it was just a standard cat." Skratch's purr wavered slightly. "Then what?" "The cat suddenly jumped on the thing and ate it," shivered the Wabbit, "and it started to glow." Skratch began to feel itchy. "The cat or the thing?" He rubbed at his fur in several feline locations. 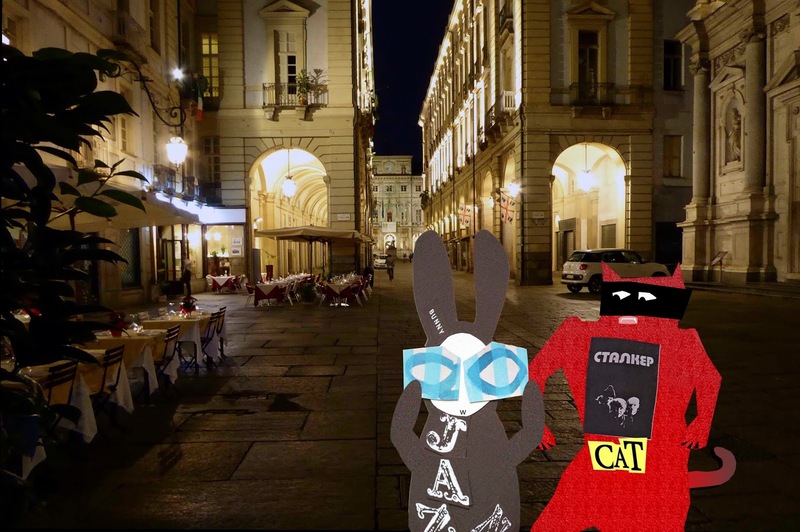 "The cat glowed," said the Wabbit. Now an image formed in Skratch's mind. Shudders ran up and down his spine and he gritted his teeth. "It's a tracker," he grunted. "And it's coming." The Wabbit looked doubtful. "Coming for what?" Skratch sighed. "Coming for you, Wabbit." The Wabbit waved his paws around. He was suspicious of predictive dreams but he didn't discount them either. Skratch scratched his chest and the Wabbit followed his movements. "You seem to know more about this tracker than me, Skratch. What will it look like?" "Very credible," purred Skratch. "Credible as they come ..."
Lapinette pressed the shutter. The camera flashed and the scene changed. A ghostly rabbit floated over an equally ghostly restaurant. Around his head was a dark halo and his piercing eyes were a sapphire blue. "These are for you," said the rabbit. His outstretched paws held two prints and both depicted Lapinette and the Wabbit assaulting the camera. 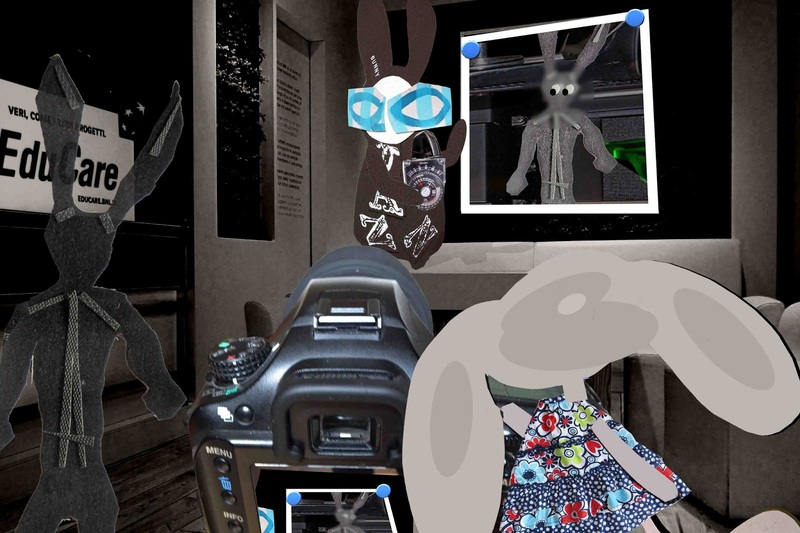 The Wabbit took his print and scrutinised it. Then he looked up at the rabbit and spoke. "You are Tibbar." His voice was quiet. Nonetheless, it echoed sharply from the vaulted roof. The dark rabbit nodded. "We have a common interest, Wabbit." But the Wabbit shook his head. "No. I have no interest in modifying the wicked. That's something they have to do for themselves." Tibbar's eyes flashed. "I returned your friend, Skratch." "It was a spiteful joke to take him," retorted Lapinette. Now Tibbar laughed. "You used violence to get him back." His smile was a sneer. "So you are just the same as me." The Wabbit stood his ground. "Hardly," he said. "You look a little dead to me." He tore up his print and scattered the fragments over the balcony. Lapinette followed suit. Tibbar raged in pain. He gathered the remaining fragments and clutched them to his chest. He howled long and hard. Then Tibbar and the fragments and the camera vanished as if they had never been. Lapinette stared at the Wabbit. "How did you know? I've never heard of Tibbar." "It was a lucky guess," said the Wabbit. 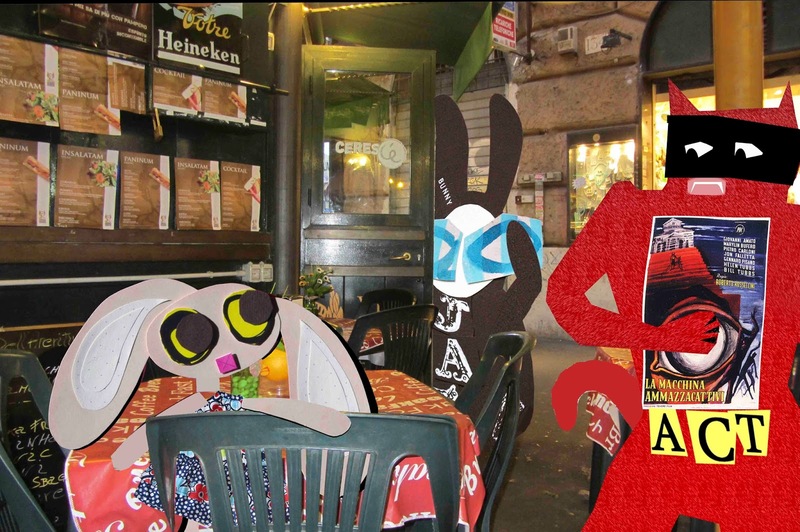 The Wabbit threw Skratch's paw across his shoulders and Lapinette did the same. The Wabbit grabbed the camera and they loped for the exit. Skratch's knees dragged along the walkway. His legs were rubber and his head was worse. He tried to miaow but it was a drawn out moo. Lapinette wore a worried frown. "Where's the bad guy?" she asked. "Inshide" slurred Skratch. But his head drooped and he slumped. The camera whirred and the electronic voice spoke. "Bad guy retained for conversion." The Wabbit shook his head. He hauled Skratch with speed and shouted at the camera, "I want everything back the way it was." "Recognising the wicked," whirred the camera. 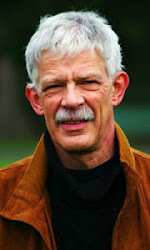 "Recomposing to good. Commencing modifications." The Wabbit could think of nothing that would halt it. Suddenly the flash fired and a red light blinked. 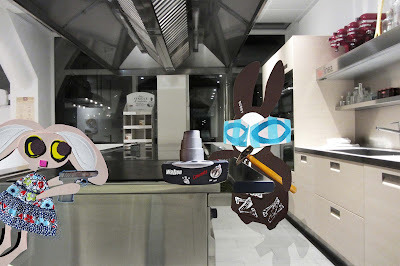 From inside the camera, the Wabbit heard liquid sloshing and he noticed a chemical smell. 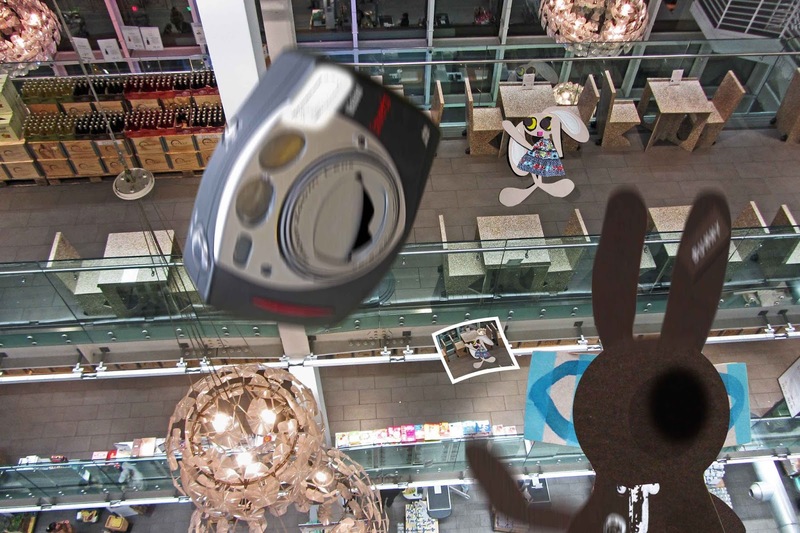 A print floated out and the Wabbit let it fall. He could see it was the Agent of Rabbit, but the face was heavily blurred and he cursed silently. He wrinkled his nose and looked at Lapinette and hissed. "I wanted him in one piece." Lapinette seized the print. "Do you have another camera?" The Wabbit nodded. "I always have another camera." Lapinette grinned as they pulled Skratch to safety. "Then I have an idea." The Wabbit's eyes flashed. "Blowup ..?" Skratch was framed and frozen. His mind wandered through apertures. 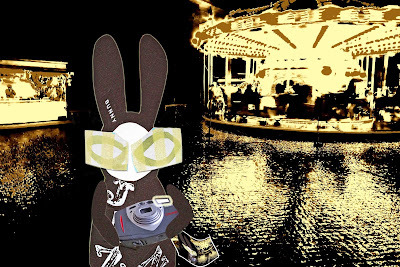 He could see the Wabbit and Lapinette but his view was fragmented. They were talking in mirrored snatches. "Is he out?" said Lapinette. "Out and in" said the Wabbit. He noticed Lapinette had a gun. The Wabbit carried a hammer and it looked edgy. 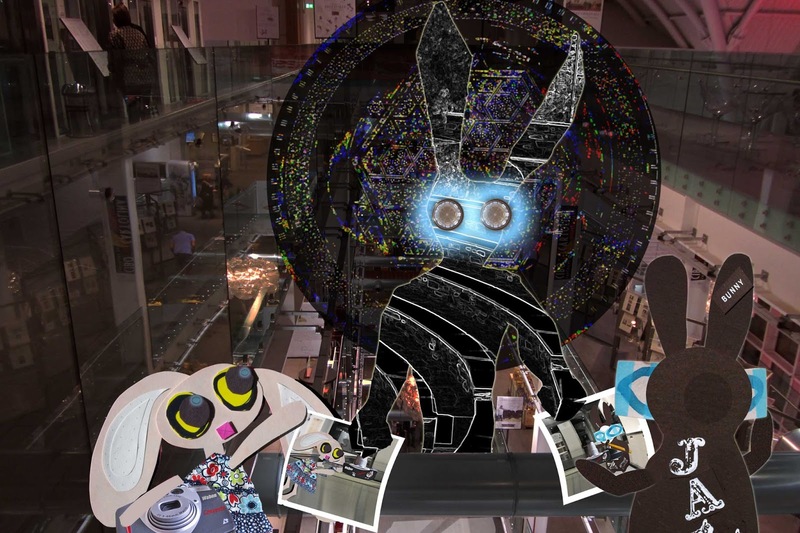 "Inside out," said the Wabbit. "Outside in," said Lapinette. Skratch thought hard and searched for an opening. "He can hear us," said the Wabbit. 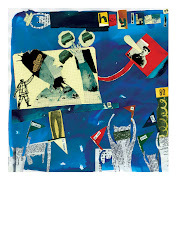 Skratch tried to shout but his miaow got lost in the fragments. The Wabbit was speaking. "He's stuck." Lapinette pointed her gun. "Sticky situation," she yelled. 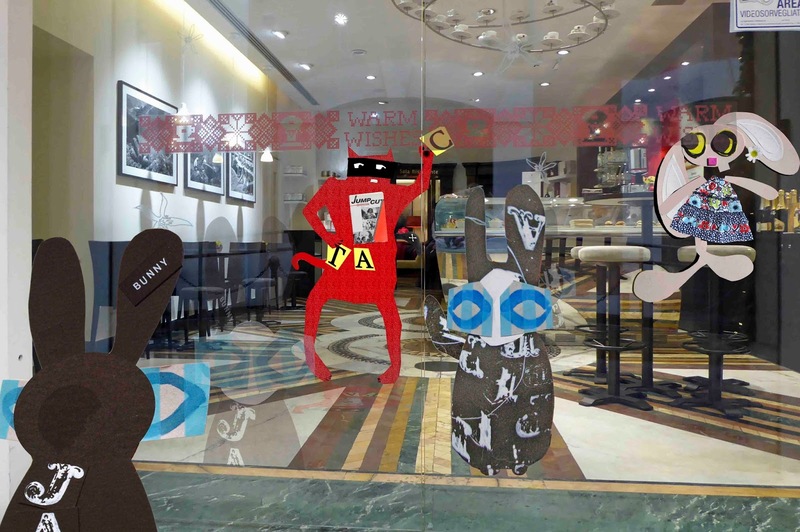 "It's a breakdown," shouted the Wabbit. "Breakdown, breakthrough," screamed Lapinette. Skratch watched the Wabbit's hammer. It twitched. Skratch looked hard at his paw and willed it to move. It was impossible. Layers bound him fast. Three cracks of an automatic rent the air and then everything shook. His paws flexed and his chest expanded and he yelled. "Give it all you got!" Strength flooded through his limbs and he bunched his paws and swung them just like the Wabbit's hammer. Glass crashed as he smashed his way free. He saw himself lying on the floor of a kitchen. 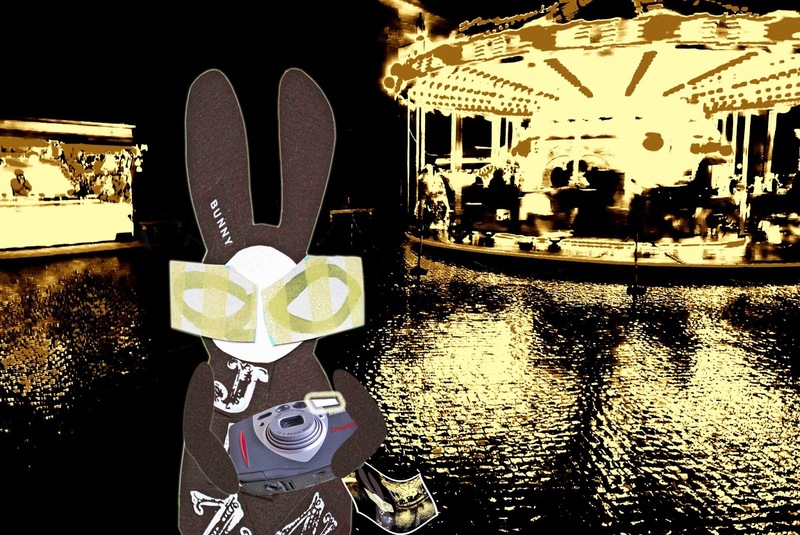 The Wabbit was peering down at him and smiling and asking, "Did I get your good side?" They both seemed to fade. "Iris in," purred Skratch as he passed out. "We've got to sort out this Brownie," said Lapinette. 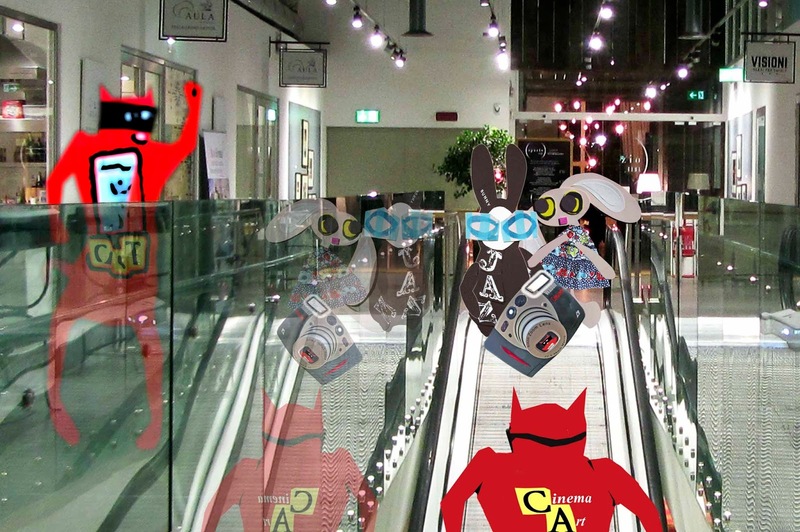 The Wabbit grabbed the camera and made for the escalator. "It's a bench job!" He shook his head in anxious anticipation and kept out of the way of the camera lens. "I don't want to end up in a box." Lapinette saw what looked like a red reflection. "There's Skratch!" she said with relief in her voice. "He can help!" Skratch the Cat smiled as he rumbled up the elevator. "New camera, Wabbit? Come on, do me a portrait." "No!" yelled the Wabbit in horror. "It's not working." But just at that moment the camera wriggled from his grasp. The shutter snapped and the flash blazed. For a moment nothing happened. "Aha," laughed Skratch. "It's an old fashioned camera. When do I see my picture?" The Wabbit grabbed at the camera. "You'll have to wait." Skratch laughed again. "Someday, my prints will come." But Lapinette was yelling and pointing - and the Wabbit followed her gaze. Behind the glass screen, a lurid comic strip version of Skratch faded into view. He was waving just like Skratch and his mouth was saying something inaudible. Then he dissolved into nothing. Lapinette looked at the Skratch on the escalator. He too was fading fast and before long the escalator was empty. "Skratch will come back," hoped the Wabbit, crossing his paws. Lapinette looked at the Wabbit with big eyes. "Can you fix it?" The Wabbit looked back. "We'll wait and see what develops ..."
The Wabbit took the camera to a nearby restaurant to examine it in the light. In the cosy company of his fellow diners, he looked it up and down. He pressed every switch and turned every knob. He took the battery out, scraped the terminals and put it back. Finally he whacked the camera on his table. But no matter what he tried, nothing happened. "Oh." said the Wabbit. He made a sound between his 28 teeth that was partly annoyance but mostly disappointment. Just as he'd given up, he heard familiar footsteps and knew it was Lapinette. So he looked over the rail and called down. "I'm up here in the carrot section!" Lapinette looked up and waved. It was a formidable restaurant, world famous for its slow-cooked carrots - and they both met there with monotonous regularity. At that moment the camera whirred, jumped and span out over the rail. Its lens cover popped open and the flash went off, just like the first time. The Wabbit blinked. Now all he could see was a glaring white rectangle. The camera made the same sloshing sound as before, then it gurgled, clicked and ejected a snapshot. The Wabbit made a swipe and grabbed it. There was Lapinette staring out of the photo. Suddenly her image vanished as if it had never been there. The Wabbit rubbed the print with a paw. It was a little damp and smelled of bleach. 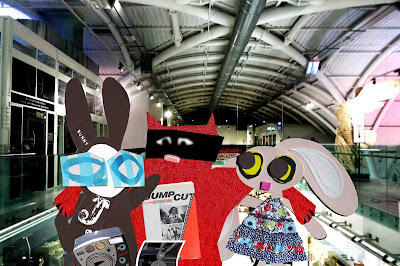 The Wabbit puzzled as he watched Lapinette's image gradually fade back into the picture but he could hear Lapinette yelling. "Wabbit! Wabbit!" She was waving something she'd caught in her paw. "Wabbit, you dropped your camera ..!" 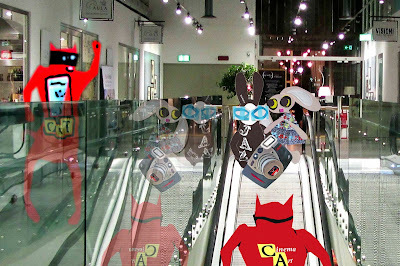 The Wabbit was late. It was a new caffè and he just couldn't find it. Wabsworth ushered him in. "We're in the back room, everything's laid out." Skratch the Cat waved his cat letters. "They fell off in the night!" Lapinette beckoned for a waiter to bring glue and pinned a flower behind her ear. "What was that for a sort of adventure, I really can't recall." Wabsworth was ready. "It was an oneiric adventure." 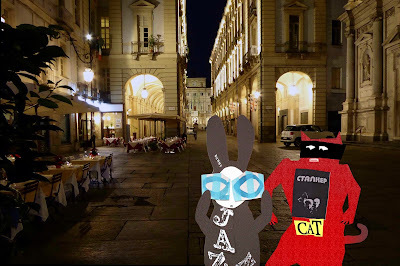 The Wabbit nodded his head, swayed his ears and looked directly at Skratch. "Oneirics is your territory, feline one." Lapinette butted in. "One of us had a nightmare, because they felt they could not accomplish a task." She stared at the Wabbit but spoke to Wabsworth. "You don't dream of course, being an android." Wabsworth shuffled his feet. "I ... am able to create a trance-like episode that is dream proximal." He threw a meaningful glance at the Wabbit and got one back. Now Skratch became impatient. "A dream in a film moves the protagonists across suppressed or hidden boundaries." Lapinette said, "Ah." She tucked her legs under the bar stool and looked slowly around. At last her gaze fell on the Wabbit, "Sleeping well, Wabbit?" The Wabbit wore a deadpan expression. "Like a dog." His attempt at a diversion went nowhere. Lapinette's gaze kept travelling and settled on Wabsworth. "It's you. You tried to help the Wabbit sleep, by successful-ising his dreams." "If only I could," sighed Wabsworth. He laughed quietly to himself. "That would be a dream come true ..."